I’ve wanted to take part in this race for ages as it’s just down the road and I’ve previously had to withdraw due to illness a couple of years back. 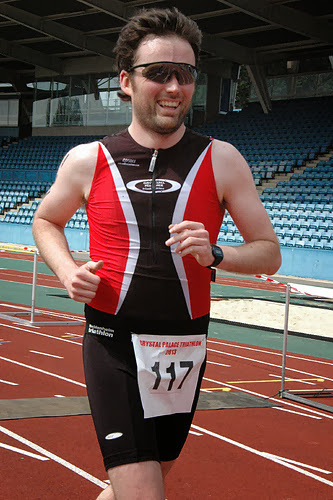 It was my first time wearing the colours of Crystal Palace Triathletes who run the event so I was hoping not to look too daft especially as this event was part of the infamous London League. The swim takes places in the FINA approved 50m indoor swimming pool with 15 lengths of the pool making up the 750m swim. The bike is 9 laps around the park with no traffic, making up 20km. The run is a further 5km around the park finishing in the famous athletics stadium on the track. The whole event is inside the park making it great for spectators as there are lots of opportunities to get “papped” by your mum. If I stay in the club it’s likely I won’t be able to take part again for at least a year which is a club rule. This is a shame as this is one of the best and most convenient triathlons I’ve ever take part in. As soon as I finished I was off on marshalling duty for the rest of the day which hope will earn me some good will.